This fine volume has been put together by Bead Style Magazine, part of the Kalmbach Press family, and I think that you are really going to like it, especially if you are a beginner. In Multistrand Jewelry, most of the projects are simple, but very nicely done, and I would recommend it most strongly for someone who has fallen in love with stringing and who wants to move to the next level with some great looking multistrand pieces. There are 31 projects - even more when you take into account all the suggested variations - by quite a number of very fine designers. There are the wonderfully clear directions that Kalmbach is famous for, and great tips for success from the designers. Beginners, you will love it! I would love to win this book! I have not made any multistrand necklaces yet and love the look. I can't even begin to describe how ecstatic I would be if I won this book! I would sooo love to win this book. I've seen an excerpt or two from it and now your review. It looks fantastic. I'll be crossing my fingers. I just tweeted about your review and giveaway. I really would love to win this book. Pretty please count me in for this awesome giveaway! Thanks a bunch! Would soo luv to add this book to my beginning library of books. Typical novice here. Tried one multistrand necklace and it was not successful. HJopefully this booik could teach me the correct way. Thank you for the giveaway offer! Looks like a great book. Thanks so much for the opportunity to win this book. I absolutely love making necklaces and this would give me even more ideas. I'd love to win this book. Thank you, Cyndi. I've shared about this great giveaway at my Facebook. Thanks for facilitating this giveaway! The book looks scrumptious! While I'm here, thanks, too, for your excellent tutorials - I can't tell you how much they've helped my beading addiction! First, I'd like to thank you for all the information & projects your share. Your blog is an inspiration. So, Thank you. I'd also like to thank you for the opportunity to win the Multistrand book. I love multistrand books and have created a few but it would be nice to have more ideas. Thank you! Looks like a very interesting book. Sorry to hear about all the spam and don't mind the word verification. I am a beginner, and I am quite obsessed about beading. I would love to win this book, as I'm sure it would help me a lot. This would be a lovely addition to my jewelry making books. It could only improve my skills and knowledge...which is what I strive to do...everyday!! Hope to win this--I love to make and wear multi-chains. I would also like to say good luck to all of us, happy Jewel Crafting! I'm in love with the necklace on the cover!!! I make mostly OOAK jewelry and no matter how hard I try, it usually ends up symmetrical or mostly so. I hope there are more asymmetrical inspiration pieces in this book and would love the chance to win it. Thanks for this generous offer. this book looks very interesting and stylish. I would love to be entered. I have been trying to do the multi strand jewelry a lot lately. It would be very awesome to get more information on the best connections. Pinned on my DIY Jewelry board for an additional entry. I hope it gets repinned and sends lots of people to your wonderful site. Sure would love to win this book and would love to make the cover necklace...beautiful. Thank you for thw opportunity. That looks like a fabulous book, I'd love to win it! Thanks so much for hosting this give away! Hope you are having a fantastic and productive Spring! 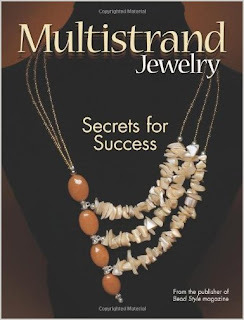 I shy away from multi strand necklaces, so this book might be exactly what I need! I think this book is my next step to creating the type of jewelry I would like to make.